Newcastle United suffered their fifth home defeat of the season in the Premier League as Brighton and Hove Albion claimed a 1-0 victory. 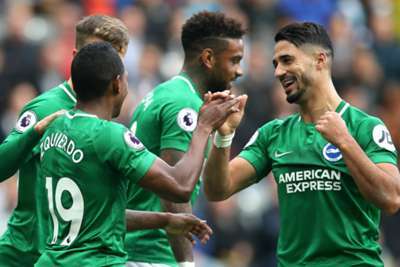 Beram Kayal deflected Jose Izquierdo's shot into the net just before the half-hour mark to give Chris Hughton all three points against his old club away from home for the first time. The result sends Newcastle to the foot of the table, three points from safety and still without a win in the top flight this season. Rafael Benitez's side controlled much of the possession but could muster little more than half-chances in front of a St. James' Park crowd that became increasingly frustrated as the match wore on. Glenn Murray clashed heads with Federico Fernandez and received six minutes of treatment on the pitch, having apparently been knocked out before he was taken off on a stretcher while receiving oxygen. The game resumed at a sedate tempo until the 29th minute, when Izquierdo's shot deflected through the crowded Newcastle box before catching Kayal's foot and nestling in the net. Newcastle stepped up the pressure and should have levelled before the break, Yoshinori Muto heading over with the goal gaping after Mat Ryan had saved well from Jonjo Shelvey. Benitez's side were persistent in creating chances but failing to hit the target, with Kenedy and Matt Ritchie each blasting high from promising positions and Fernandez heading another opportunity over the bar. Many home fans headed for the exits before 90-minute mark, seemingly resigned to a seventh loss of the season, which would have been made worse had Yves Bissouma not missed a one-on-one with Dubravka in injury time. Saturday's defeat means Newcastle have lost their first five home league games of a top-flight season for the first time ever. Only three other teams – Manchester United in 1930-31, Portsmouth in 2009-10 and Bolton in 2011-12 – have ever done the same. They are now rooted to the bottom of the table and some serious questions will start to be asked about Benitez and his chances of keeping them up this season. A result away to Southampton next week is surely a must. Brighton, though, are up to 12th in the league, having ended their 17-game wait for an away win. Newcastle might have produced some appalling finishing, but Shane Duffy was equally responsible for them failing to score. The Brighton centre-back managed 19 clearances as his side held onto their lead for the best part of an hour, and marshalled the rest of the back four superbly. Plenty has been made of Newcastle owner Mike Ashley refusing to back Benitez in the transfer market, but the manager seems unwilling to rely on some of the players he did get. Centre-back Fabian Schar was on the bench and Ki Sung-yueng was not even in the squad. In their absence, Newcastle's midfield sorely lacked creativity and the defensive pairing of Fernandez and Jamaal Lascelles was unconvincing. - Newcastle are just the fourth team in English top-flight history to lose their first five home league games of the season. - Brighton had just two shots on target in this match - their goal in the 29th minute and then a saved shot two minutes into second half injury time. - Newcastle attempted 27 shots without finding the net – their most in a Premier League game without scoring since February 2014 (28 against Sunderland). - The Seagulls picked up their first away win in 18 league games, since beating Swansea in November 2017. - Brighton have secured back-to-back Premier League victories for the first time since March. Newcastle's visit to Southampton is the next in a run of games they will hope will produce some more positive results, with Watford and Bournemouth visiting the north east early next month. Brighton will host Wolves next Saturday, and a win will take them to within a point of the reigning Championship champions.